MARK NANCE/Sun-Gazette Mifflin County's Wyatt Henry tries to break up a pass to Williamsport's Marcus Simmons (21) on a touchdown in the first quarter. Coming into the season, Williamsport quarterback Joe Fagnano was a little uneasy about stepping into the spotlight following the career of Williamsport all-time leading passer Isaiah Hankins. And who could blame him? But like Dak Prescott following Tony Romo, Fagnano is making it look easy. Fagnano threw 270 first-half yards and five first-half touchdowns, while playing just two second-half snaps, as the Millionaires routed Mifflin County, 49-26, Friday night at STA Stadium. 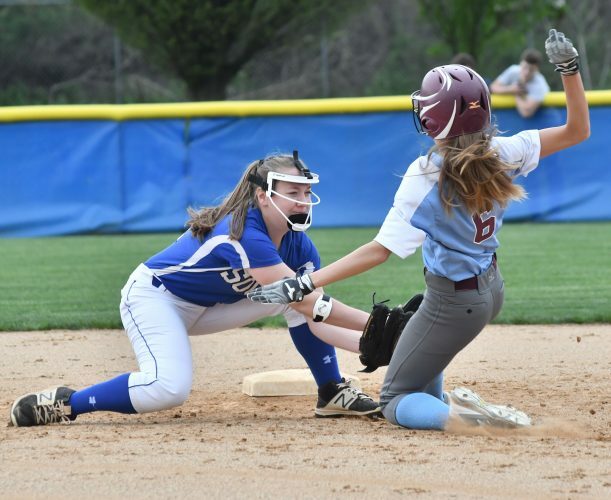 Williamsport opened its season 2-0 with two straight blowouts while Mifflin County dropped its season-opener. Fagnano looked like a four-year starter for the second straight week, rolling out on play action fakes, throwing on the run, reading through his progressions and accurately hitting his receivers consistently. Before his two starts this season, Fagnano has just played a handful of meaningful snaps playing behind Hankins but he hardly looks inexperienced. The junior led the Millionaires on three touchdown drives before Mifflin County even recorded a first down. On his first drive, Fagnano went 5-for-6 with 57 yards, including two big third down completions. His last completion on third down found Marcus Simmons in the end zone. On the next drive, and again on third down, Fagnano found his tight end, Ethen Stryker in the back of the end zone for the two-score lead. After Blaze McClements recovered an onside kick, Williamsport scored its third touchdown on a three play drive capped by Latrelle Jackson’s two-yard run. Fagnano added three more touchdowns in the second quarter, a 33-yard pass to Simmons, a 10-yarder to Stryker and a 23-yard pass with 15 seconds left in the half to Colin Esposito. Fagnano’s first three touchdown passes were on third down as the Millionaires went 8-for-8 on third downs in the first half. Always fearless and never rattled, Fagnano made the tough throws with 250-plus pound defensive linemen in his face or around his waist. Williamsport scored seven touchdowns on their first eight drives, just the one mishap being a Fagnano interception. It racked up 49 points in the first half and nearly 400 total yards as the majority of the starters were out by the second series of the second half. 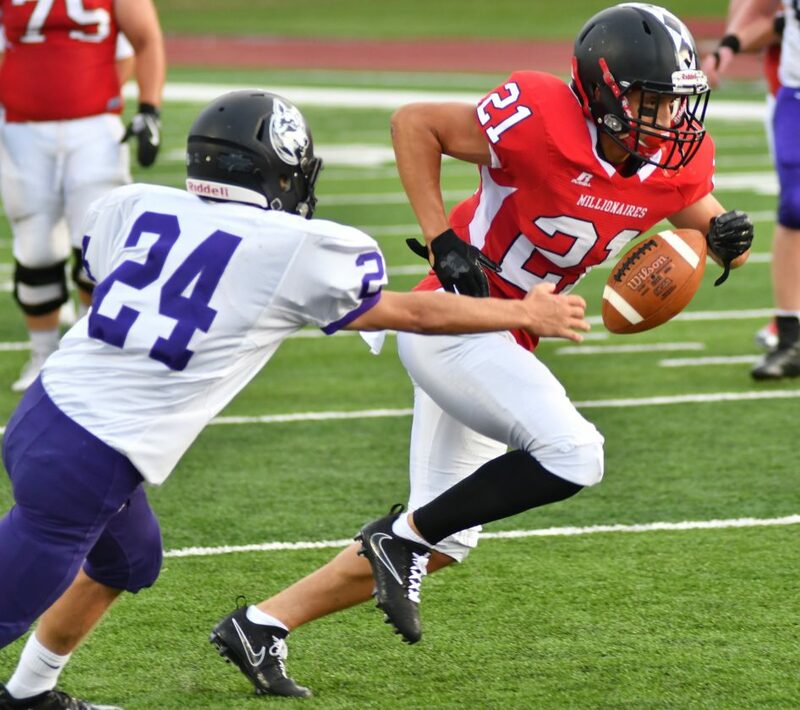 Simmons is turning into quite the all-around weapon for Williamsport as he had two first-half touchdown receptions and a first-half rushing touchdown. He finished with six receptions for 114 yards and two rushes for nine yards in addition to three total touchdowns. And Stryker gives them another big, strong tight end over the middle to make the tough catches in traffic as he finished with 63 yards and two touchdowns on five catches. The starting Williamsport defense held down Mifflin County as it racked up just 95 first-half yards, 51 of those on a nice catch and run from Kross Todaro that saw him break two Williamsport tackles while tip-toeing down the sideline. But the second unit struggled, allowing 20 second half points while the Mifflin County reserves put on a show. “The score wasn’t as close as it showed at the end. They have a nice team. They’re a little bit better than I thought they were,” said Mifflin County coach Brent Hartman.